In this phase the body needs extra nutrition for the developing fetus, pregnant woman herself and the lactation period to follow. These nutritional demands have to be met for a healthy child and mother. 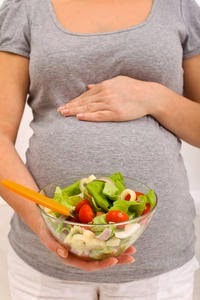 The diet before and during pregnancy should be rich in calories, proteins, vitamins and minerals. Two to three servings of dairy products is essential for a pregnant woman daily. This can include milk, yogurt, cheese and eggs as well. Milk and eggs are low-cost supplies of calcium and protein. For vegetarians, soy protein, nuts and beans can be good substitute. Vegetables and fruits: these provide vitamins, minerals and fibre. Food items that are rich in vitamins and minerals are essential for the pregnant woman. There is requirement of higher dose of certain vitamins and minerals. If this is not covered through pregnancy diet, they are prescribed dietary supplements. However, increase in servings of fruits and vegetables daily help pregnant women keep fit and it also protects the child from certain typical birth defects also. High complex Carbohydrates: Three servings of cereals, whole wheat grains and other high complex carbohydrates are essential for pregnant women.